LONDON: JOHAN PADAN AND THE DISCOVERY OF AMERICA – YOU’LL EITHER LOVE IT OR YOU’LL HATE IT! “Who would have thought a trip to the theatre could ever be compared to a bite of marmite on toast? Watching audience reaction to Mario Pirovano as he pranced about the stage delivering his one-man cabaret. I fell decidedly amongst the marmite lovers, but there was a sizeable proportion of haters too: Dario Fo has excelled in concocting a recipe for the acquired taste. (…) Mario Pirovano, amused by his own comedy and disturbed by his own anger on this journey, is a consummate player of political satire. His performance is so believable – an Italian accent that leaves him tongue-tied; embellishments and regressions which are so much a part of everyday storytelling – that it seems inconceivable any one part of his script could be written down and learned from the page. Pirovano has his audience (those who enjoy their marmite) fixated as he relishes and revels in the oral tradition. The story is a fabrication, but as he elaborates on situations – at times debasing images to a grotesque, Swiftian level – the audience’s imagination is stimulated and becomes as jumbled and unsynchronised as the gestures on stage. The stage may be empty and performer Mario Pirovano may be dressed in black, but his word pictures use every color of the rainbow. Pirovano is a charming performer, very generous with his voice and body. His wonderfully mode of performance encompasses an amusingly self-deprecating dialogue with is audience. Pirovano is the translator of Dario Fo’s text, and this performance is far more than the artless exercise in storytelling. In a sense, this is antitheatrical theatre, played by a man on bare stage, without costuming or any other theatrical props. We place ourselves into the hands of a marvellous performer, who can make us laugh with serious intent, and provides a very timely critique of the ugly habit of demonising and demeaning “inferior” cultures. L’attore ha affascinato il pubblico, lanciandosi con tutto il corpo nella narrazione. Applausi a scena aperta hanno sottolineato i momenti più belli, più divertenti e più “punzecchianti” dello spettacolo. Mario Pirovano non recita. Le sue sono performance da fuochi d’artificio che incantano lo spettatore trasportandolo nel mondo magico e straordinario della narrazione a cui Mario dà tutto di sé. The irriverent humour of Fo’s script is admirably rendered by Mario Pirovano. The engaging, passionate Mario Pirovano delivers a riveting stripped-back performance –a reminder that in skilled hands a tale simply told can be the most compelling theatre. Dario Fo, now 77, has been a powerful voice of international theatre for decades. The Nobel Prize-winning Italian playwright and his partner, Franca Rame, have massively boosted the shaky cause of in-your-face left-wing theatre. But until now, Australian audiences have had to rely on Australian and English productions of his plays. These have given the Italian originals a local lumpen voice – working-class British or streetwise Aussie characters dealing with European dialogue. That has implied an Australian or English cultural view and the pieces have often tended to come over as brittle and even agit prop comedies. Recognition of the Italian source material for the most part has been bad accents or commedia dell’arte devices. It is a completely Mediterranean performance, full of codified body language, broken accents, vocal gymnastics and a glorious warmth of passion. Pirovano draws heavily on the prime source of drama, storytelling. He introduces himself, his characters, the narrative, and then joins in the action: all of it done alone on stage with no sets, no props and aided only by a body microphone. (…) Mario Pirovano gives a radically different and enlightening interpretation of Fo in his Johan Padan & The Discovery of America. Pirovano is from Compagnia Teatrale Fo-Rame, so he is speaking from the source. 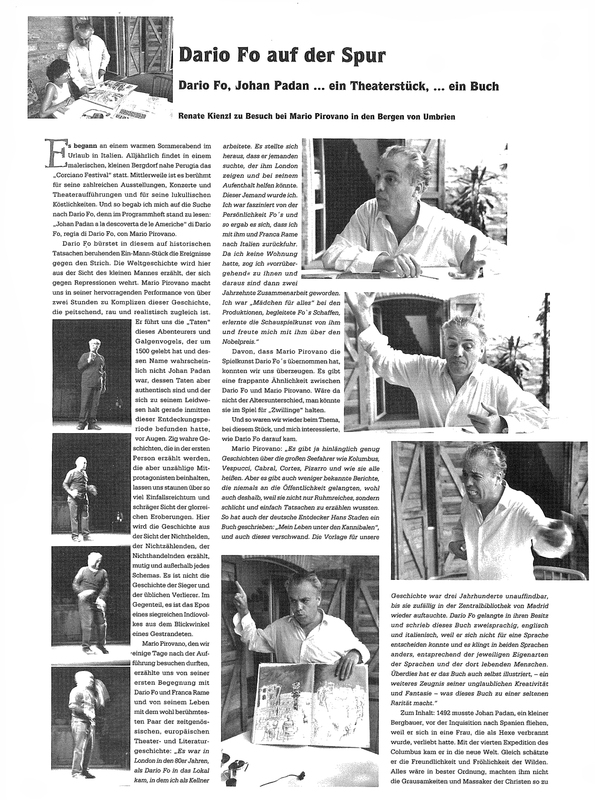 But his interpretation is most definitively an Italian’s view of how a Fo play should sound in English. 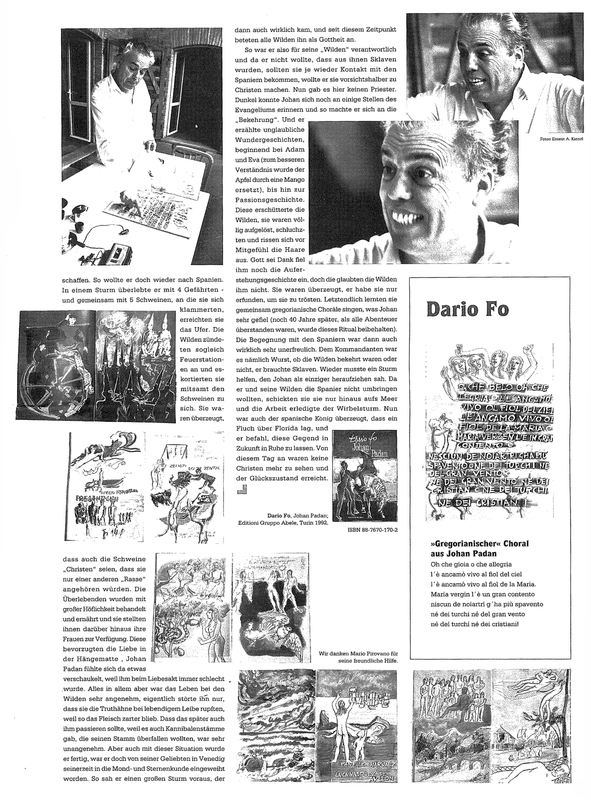 Pirovano’s visit to Australia single-handedly fixes a lot of misconceptions about the meaning of Dario Fo. Mario Pirovano was agile – both verbally and physically – filling the stage with story as he sang and danced. Pirovano worked with no thecnology, not even costume, scenery, lighting or offstage music. His craft invited the imagination of the audience to travel with his character through time and space. For me one of the most memorable performances of the highly successful Thirty Third Hong Kong International Arts Festival, which has not long concluded to general approbation, was a piece of burlesque, irreverent and politically topical storytelling narrated by a one-man-band of an entertainer from Italy at the Studio Theatre of the Cultural Centre. The Festival offered some exceptional fare this year, but I stand by my choice, out of personal taste and experience. In the irrepressible Mario Pirovano Fo has found the perfect interpreter for his farcical historical critique (…). Fo’s play, and Pirovano’s bravura performance of his dramatic monologue, were, in keeping with the theme of the Festival itself, sacred and profane in their references (…) Pirovano’s commedia dell’ arte -influenced storytelling style is pure burlesque, with a heavy emphasis on ludicrous impersonation. It follows the Swiftian and Voltarian technique of picaresque storytelling by an ‘ingenuous’ narrator, i.e. a naïve and hapless innocent, to increase the comic effect and indicate the sheer absurdity of the enterprise.Pirovano’s own English language delivery, whilst idiosyncratic and heavily, but of course appropriately, accented, was remarkably fluent. It hit the comic mark unerringly and together with his delightfully expressive body language, which managed to convey everything from a hurricane to a wild horse, created a palpable chemistry with an entranced audience. Some of the comical difficulties of cross-cultural translation actually helped to break any initial ice, as opposed to creating barriers to comprehension. Having said that it is clear that comedy, that is both linguistic and physical, as this is, can at times be difficult to translate just as it is for a foreign audience to decode. In that sense any non-Italian audience, European or Asian, is foreign. It is not just a matter of a perceived East-West polarity. It has to be said that this particular translation for this particular actor worked magnificently. It would have been so unconvincing had the performance been delivered in dulcet native English speaker tones. Perhaps we shall be reading and listening to accounts of Bush’s and Blair’s Iraq ‘adventure’ by deserters and renegades delivered in similarly comic style in the years ahead.